WESTCHESTER, NY--(Marketwired - Mar 18, 2014) - In letters to prospective benefactors, two prestigious universities -- Columbia University and the University of Arkansas -- have expressed interest in the Caren Collection, comprised of more than 200,000 items that document most every major U.S. and international historical and cultural event dating back to pre-revolutionary times through the 20th century. A third institution, located in the Northeast but preferring to remain anonymous, will be sending three of its top people to review the Caren Collection this week. Calling the Caren Collection, "a resource that is unparalleled in content, providing historical reference material covering the American experience as well as international history as it was first reported in the newspaper," James G. Neal, Vice President for Information Services and University Librarian, this month wrote that "Columbia University would be honored...to participate in recapturing and rejuvenating the history of our nation for all to respect and remember." According to Carolyn Henderson Allen, Dean of Libraries at the University of Arkansas, the Caren Collection "would add a truly unparalleled collection certain to provide the University with heightened national visibility," and "would greatly enhance support for the University's programs" in Southern history, Civil War, African-American and Western history, American literature, American folklore, and American political science. The Caren Collection contains originals of newspapers, magazines, broadsheets and photographs, not reproductions or facsimiles. Highlights of the more than 200,000 items in the Caren Collection include: The Presidential-signed first treaty between the U.S. and China (1840's); the earliest printed accounts of New Amsterdam (1620's); an issue of the Boston Newsletter, the first successful American newspaper; the Great Fire of London reported in the first successful English-language newspaper (1666); newspaper and/or magazine printings of the Declaration of Independence, the U.S. Constitution, and the Bill of Rights; a 1690's manuscript report on New York and New England; an illustrated contemporary account of the Boston Massacre (1770); a Revolutionary War-era letter discussing the creation of the New York State constitution (1777); and thousands of curated news photos from 1900-1970. Eric C. Caren was the owner of the now-famous "Do Not Publish" photograph of Diana. Over a 40-year career, he has collected many rare original photos of famous people and events; complete newspaper coverage of the entire history of professional baseball; thousands of rare newspapers and magazines covering every presidential administration from Washington to Obama; Civil War newspapers and Western newspapers; the history of African Americans, Native Americans and women; complete coverage of the French Revolution as published in an illustrated Paris magazine; and the complete history of flight from ballooning to space. Most of the material contained within the collection is not available at the Library of Congress, Smithsonian Institution, or the New York Public Library in original format. "Photographic and digital reproduction makes information held in rare, fragile documents available to the masses, but every reproduction technique hides nuances of the original documents, and introduces subtle ambiguities," said Don N. Hagist, author of "British Soldiers, American War: Voices of the American Revolution" (Westholme Publishing, Feb. 2014). "There is no substitute for the original documents to confirm the veracity of information and to seek undiscovered details. Original documents also provide a tangible link between the person who created them and the modern researcher, a human connection that can't be obtained in any other way. For an institution to attract top-tier researchers, it is essential to original and unique source material." According to Caren, "In this age of digitization, photographs are easily manipulated, and texts are easily altered to make future generations believe the opposite of the information that the originals convey. For that reason, having access to the original editions is important. I hope a benefactor steps up to donate the collection to an appropriate U.S. institution so that the collection doesn't end up in China or Europe." Caren is selling this collection en bloc to fund future acquisitions. A prior collection from Caren was acquired to form the nucleus of the Newseum, the Washington, DC, museum that features five centuries of news history with up-to-the-second technology and hands-on exhibits. Eric C. Caren began collecting at the age of five, eventually turning a hobby into a full-time business. Caren is the CEO of Retrographics Publishing, a licensee of the New York Times; and the author of 12 books (published by Castle Books and the Smithsonian Books). He is also a member of the Grolier Club and a consultant to the Newseum. For more information, visit: www.thecarenarchives.com. 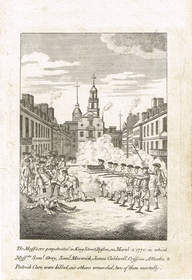 A 1770 London rendering of the Boston Massacre, one of 200,000 items in the Caren Collection, called an unparalleled collection by Columbia University.